PrankPack gift boxes will definitely get a laugh out of any recipient on your gift list. The boxes are decorated to look like a ridiculous product is packed inside, including devices to mount any gadget on your arm, steering wheel, in your shower or the ever-popular Wake & Back Dream Griddle alarm clock. The griddle box is pictured with a woman sleeping along side the alarm clock/griddle. This allows you to be awakened by the tasty bedside options of eggs over easy and pancakes, which doesn’t sound bad! The enthusiasm (or lack of) will be priceless while watching the gift recipients read the package only to open it to find the real gift. 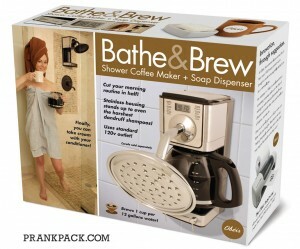 The Bathe & Brew is both a shower-mounted coffee maker and soap dispenser, pictured with the shower faucet coming out of the coffee itself. When you read on, you find that a 120v outlet is needed right there in the shower! The XtremeMac Soma Travel speaker dock is as good a traveling portable speaker system as I’ve seen. It’s built with a dock for the usual Apple devices (iPad, iPhone & iPod) and is sized to easily fit in a computer bag or any type of luggage since it measures about 10 x 2 x 3.5-inches. One thing I noticed right away: typically descriptions on the side of electronic boxes indicate what is included in the box, but that’s not the case with the Soma Travel. What it does say is what’s not included and XtremeMac tells you there are no AC adapter or batteries are required because the speaker is powered by your device. 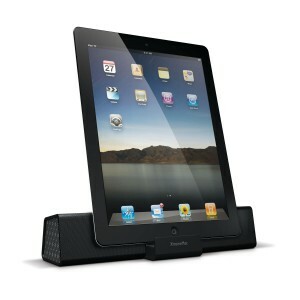 XtremeMac refers to the speaker as a “dock and play” and it certainly plays your music or videos anywhere or anytime. 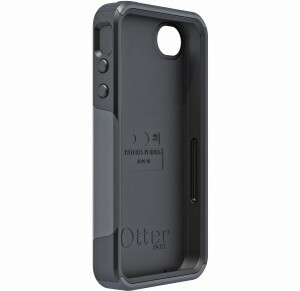 Shopping for iPhone cases seems more challenging than car shopping until you come upon my favorite from OtterBox. While I’m not trying to be a marketing agent for the company, I’ll just tell it like it is: they make great stuff. You’ll see how true this is when you have one in your hands. It’s no wonder they are the industry leader when it comes to protecting high-priced portable gadgets. My personal choice is the Commuter series ($22), which is a two-piece design consisting of a silicone skin-tight shell that fits perfectly into a hi-impact polycarbonate shell. This enables my phone to be nearly 100 percent protected since the case includes a self-adhesive screen protector. The rugged Defender series has about everything needed for battle and can be broken down to use in parts or as a whole. When enclosed in the complete package, your phone is covered by several layers of protection, yet is still fully functional. A polycarbonate shell has a built-in screen protector and then is surrounded by an impact-absorbing silicone shell, which fits in perfectly in the included belt clip that swivels both north/south and east/west depending on your preference. The newer Reflex Series is the more stylish option. A neat feature of the case allows it to be split in half for easier docking options. OtterBox’s Impact series is pretty sweet and simple since it’s just a silicone shell (with the self-adhesive screen protector) and comes on and off in seconds. Verbatim’s Wireless (2.4Ghz) Mini Slimboard and Mouse are a great combination so it’s a great thing they package together. The keyboard is built with an ultra-slim, ultra-narrow design to keep the keys in a low profile but easy to access and very responsive. Measuring just 12.5 x 5.25 x 0.875-inches, it doesn’t take up much desktop space and is also able to control any media play with its built-in Media Console. 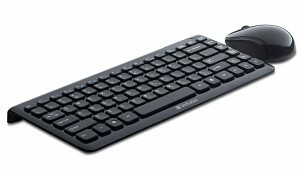 This gives users control to play, pause and adjust the volume on the keyboard itself. As for the mouse, it does what it’s supposed to do with left and right clicks along with a scroll wheel. Both the keyboard and mouse are built with what Verbatim calls a “piano black finish,” which translates into an attractive shinny black finish. I’ve written what seems like an endless amount of items about backing up your digital files, especially irreplaceable family photos and videos. The fact is most people do not back up and many only start the practice after a computer crash has taught them the hard way. 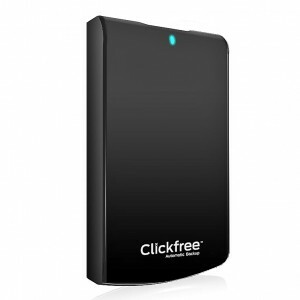 Clickfree hard drives with C6 EASY Imaging automatic backup will do it for you, but only after you purchase and install it. In the event of a complete computer crash, which everyone says won’t happen but it will, the software effortlessly restores your data. Installing it is painless; just plug the hardware it into any open USB port and the Clickfree EASY Runlaunches to automatically start backing up everything on the computer. On the restoring end, EASY Fix will restore all the personal files, software applications and the operating system. In addition to the backup/restore features, the hard drives can be used for standard storage of any type of files. Other features include EASY Music to import music from an iPod/iPhone/iPad into the iTunes on any computer, EASY Viewer to view backed-up photos and EASY Organizer to help organize your photos and other files for backing up. The drive also enables password protection with 256-bit hardware encryption. This one has absolutely nothing to do with technology _ unless you consider my coffee pot an electronic gadget. 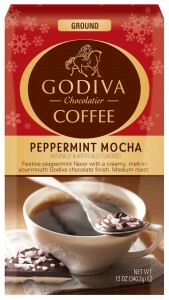 Recently I was sent a holiday gift of Godiva Coffee, which in simple terms was outstanding. The company that has made eating chocolate an art is doing the same for coffee since you can’t just stop at one and I’m hooked.